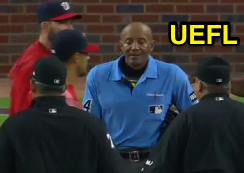 Nationals LF Jayson Werth charged at HP Umpire CB Bucknor after umpires reversed a strikeout call with two outs in the bottom of the 9th inning of the Nationals-Braves game during a chaotic sequence for Bucknor and fellow umpires led by Crew Chief Fieldin Culbreth. Bucknor appeared to initially call "Time." With two out and the bases loaded in the bottom of the 9th inning of a three-run game, Braves batter Chase d'Arnaud swung at a 1-2 slider from Nationals pitcher Shawn Kelley for an apparent third strike to end the game. After appeal from Braves 3B Coach Ron Washington, home plate umpire Bucknor alongside crewmates Manny Gonzalez (1B), Culbreth (2B), and Mark Carlson (3B) convened, and ultimately determined that d'Arnaud had fouled the ball into the dirt, and ordered play resumed with d'Arnaud still at bat with a 1-2 count. Replays indicate d'Arnaud's bat did not make contact with the baseball and that Bucknor appeared to call "Time" after the pitch's completion, the call was incorrect. Kelly struck out d'Arnaud in earnest on the ensuing pitch to give Washington a 4-1 victory. Werth tears into Bucknor after the final out. After the game's conclusion, Nats LF Werth approached Bucknor while yelling and gesticulating with such intensity that teammates had to physically restrain Werth as Bucknor walked off the field, accompanied by Gonzalez. Werth previously expressed dissatisfaction over strike calls made during a fourth-inning at-bat in which Bucknor called Werth out on strikes. Replays indicated two of the three called strikes, including the called third strike, were located off the plate. This unofficial ejection discussion is presented as an Umpire Odds & Ends post, pursuant to UEFL Rule 8-2, which governs unofficial ejections and unique umpiring situations that may not lead to an ejection. While no ejection mechanic appeared to have manifested during the strange sequence, the situation—and Werth's apparent unsporting conduct—merits further discussion. 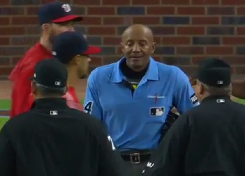 Bucknor's most recent ejection on Sunday, April 16 also concerned a mechanically unclear play. Wrap: Washington Nationals vs. Atlanta Braves, 4/18/17 | Videos (2 videos) via "Read More"